You can use your Fire tablet to shop for physical products — ones you do not use on your Fire tablet. Suppose, for example, that you want to purchase a toy or some treats for your dog. No problem; just grab your Fire tablet and use the information here to make your purchase. Buying physical products requires that you visit the Amazon website and sign in to your Amazon.com account. You make purchases using a payment method established in your account. 1From the Home screen, tap Shop. The Shop content library appears. 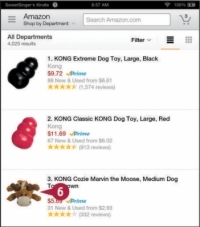 Various Amazon stores appear in the Navigation panel. 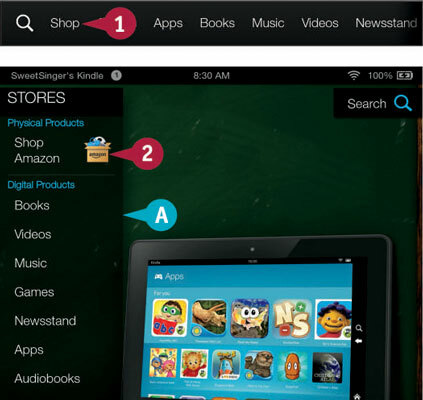 The Amazon Shop by Department page appears. 3Tap in the Search text box at the top of the screen. Type a phrase that describes what you want to buy. Products that meet your criteria appear. 5Tap a product to view its details. You can swipe up to scroll down and read more. You can tap Add to Wish List to save the item and purchase it at another time. 6Tap Add to Cart to purchase the product. 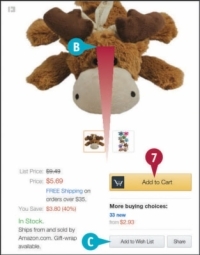 A prompt appears, asking if you want to continue shopping or check out; you can tap Continue Shopping or Go to Cart. If you tap Continue Shopping, repeat the shopping steps. When you tap Go to Cart, a summary of the items in your cart appears; follow the on-screen prompts to complete the purchase.